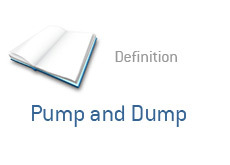 Pump and Dump - What Does It Mean? What is the definition of a "pump and dump"? A pump and dump is when someone accumulates a block of shares, touts the stock and then sells into the buying pressure that they have helped to create. A "pump and dump" is best illustrated through an example. Example #1. A couple of friends decide that they are going to pump and dump a penny stock called XYZ Enterprises, Inc.
XYZ Enterprises Inc. is a thinly traded issue on the pink sheets. They are "working" on a new cancer vaccine, though the company hasn't produced much of anything during their brief existence. These friends decide that they are going to try and execute a pump and dump. They accumulate 100,000 shares of the stock at an average price of 44 cents per share. They then spam a number of popular online finance message boards, touting the "wonder" drug that XYZ Enterprises Inc. has been working on for years now. Some amateur investors decide that XYZ Enterprises Inc. is the next big thing, and decide to buy some shares in the company. Volume spikes, and suddenly XYZ Enterprises Inc. is trading at 65 cents per share. The two friends dump their 100,000 share position in the company for an average of 60 cents per share, netting themselves a quick $20k profit in the stock. The stock quickly falls back to earth, and is trading at 43 cents per share just days after the initial spike. The amateur investors who feverishly bought the stock suffer large losses after the momentum in XYZ evaporates. This is your standard "pump and dump". Note: aside from being unethical, there is a good chance that the SEC will investigate you if you decide to participate in a "pump and dump". Note #2: the opposite of the "pump and dump" is the "short and distort", which is when someone shorts a stock and then spreads negative information about the company. Is John Paulson Losing His Magic Touch?